"I got this recipe from my grandmother in New Jersey. They fit the title, because they are out of this world!" Preheat oven to 375 degrees F (190 degrees C). Grease muffins tins, or line cups with paper liners. 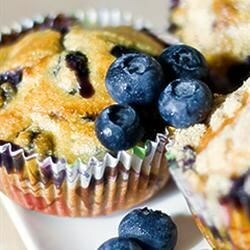 Sprinkle 1/4 cup flour over blueberries, and stir to coat berries thoroughly. In a small bowl, whisk together 2 cups flour, baking powder and salt. In a large bowl, cream margarine, and gradually mix in sugar. Beat eggs, and stir into creamed mixture along with vanilla. Stir in milk alternately with flour mixture, mixing well after each addition. Fold in berries. Fill muffin cups 2/3 full with batter. This recipe gets 5 stars with the following changes 1) use buttermilk instead of milk and 2) decrease baking powder to 2 1/2 teaspoons. These muffins were very easy to make, and smelled delicious in the oven. The taste was kind of bland, definitely not "out of this world." We ate them, but I don't think I'd make them again.